Elliott Morss examines some of the ways that quantitative easing may be helping the economy. He points out that stocks have increased significantly, which has raised household net worth by 9 percent. See the following post from The Street. On Nov. 8, 2010, I posted an article defending Bernanke's decisio n to purchase $600 billion in securities. I said, "Does he expect that much job creation will come from $600 bond purchases? Probably not. But he also understands that the US Congress is so dysfunctional that it will not pass a new stimulus package in the foreseeable future." So what happened? Certainly I was wrong, and Bernanke probably guess incorrectly as well: Congress, in the "lame duck" session, passed a new $917 billion stimulus package. Time for a reassessment. The first point to remember is that of the $917 billion, $278 billion were for a continuation of tax cuts that nobody thought would increase. That reduces the net new stimulus to $639 billion. Let's look at the US job situation: I quote from the San Francisco Fed's Monthly Newsletter:"U.S. population growth averages about 1% per year. Assuming no change in labor force participation, the economy would need to create about 100,000 jobs per month on net to keep the unemployment rate at its August 2010 value of 9.6%." For all of 2010, the average monthly private sector job creation was 113,000. For the last six months, the average monthly job growth was 126,000. It is up a bit, but hardly enough to get bullish about. John Lounsbury just wrote an article reporting on Federal Reserve Bank Vice Chairman Janet Yellen's claims that the Fed's asset purchases would end up creating 3 million jobs. Lounsbury was not convinced, nor were most of the persons commenting on his article. As I indicated in my previous article, I see little reason to believe Yellen's claims. However, NewstraderFX made an interesting point: "As of the 3rd quarter of 2010, the latest data available, household net worth increased by 9.1% as stocks rallied 10.7% over the period after getting a boost from Mr. Bernanke's first hints regarding QE II on Aug. 27 at Jackson Hole. The S&P 500 gained 10.2% in the 4th quarter of last year. "The connection here is that stocks improved after Bernanke's first hint, that HNW is nearly totally due to gains in stocks, and the improvement in HNW is supporting consumption. Obviously there has been a number of other reasons for stocks to gain, so I'm not implying the 'QE II' effect is solely responsible. But I would venture that it has been a strong contributor." Certainly, it is reasonable to assume there is a wealth effect on the upturn. Remember what caused the global recession: The near complete collapse of U.S. banks caused a global panic resulting in an equity loss of $37 trillion. That, in turn, was the primary reason for the dramatic reduction in global demand - a downturn wealth effect. Of course, as NewstraderFX says, there have been other reasons for stock market gains. Has anyone been surprised at the very negative reactions to the Fed's actions overseas? 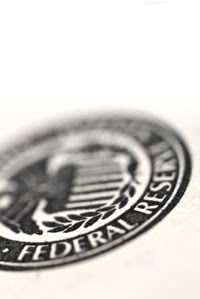 The Fed has another reason for its bond purchases that cannot be stated publicly. Consider the following: After this $600 billion bond purchase, the Fed will hold $1.4 trillion of Treasury securities. That is less than the $1.7 trillion of Treasuries held together by China and Japan. Why did China and Japan buy all these Treasuries? To prop up the US dollar artificially to take jobs away from the U.S. and to build up their export markets. Japan, concerned about the weakening U.S. dollar against the yen, increased its U.S. government security holdings by $109 billion, or by 15%, between August 2009 and 2010. Japanese companies already produce a significant portion of their autos in the U.S. That share could increase significantly with a weaker dollar. China has taken the brunt of criticism for propping up the dollar. And partially as a result of this criticism, its holdings of US Treasuries fell by $61 billion, or by 7%, between August 2009 and 2010. I can imagine that Bernanke is thinking the following: Maybe my purchase of securities will not generate many jobs in the U.S. in the near term, but this is my first step to drive down the value of the dollar globally. And if this does not work, I will print more money. What I can do to generate jobs in the U.S. is to drive down the dollar so global manufacturing will return to the U.S. This article by Elliott Morss has been republished from The Street, a site covering financial news, commentary, analysis, ratings, business and investment content.